Wow, – we may get 6 or more inches out of this storm and we have another day to go! I have tried to get a little more compost spread today but it will have to wait. The ground is very soggy and the river is rising….now, we needed some of that, the lake has been about 3 feet low the last 4 or 5 weeks now. Hopefully with the saturated ground it doesn’t get up to flood stage! With the little break in weather yesterday my little curious gardening buddy, Caleb, his new 4 month old brother Levi and mom Lizzie came down for a visit. I didn’t grab my camera and missed the opportunity to capture some of the fun. I had put together a little picking bucket for Caleb, already loaded with two jars of home-made jam. The big Meyer Lemons caught his eye first so we grabbed a few for the bucket. He wants to make some lemonade!!! Then on to the main garden. He wanted to pick some of the turnips so I said “why not”. Lizzie wasn’t sure what to do with them…I offered a few suggestions. I had some short stubby purple carrots for him to pick as well as some Danvers orange carrots, also short and stubby. The peppers caught his eye next… most the Poblanos have turned a bright shade of red and they were like a magnet for him. The bucket was getting full now. Lastly we added some red Romaine and red leaf lettuce to the bucket. I am always fascinated how there is so much wonder in the world of a curious three-year old. On the way back to his house he sat the bucket down, something in the gutter and water running through it had caught his eye. I stooped to see what he saw…..same old stuff to me but new, different and fascinating for him. My lesson….slow down and see what we take for granted. As I looked a little closer I saw some little plants in the cracks were waving and wiggling in the water as it moved past. It was pretty cool! He poked his finger in amongst the plants, stirred them around for a bit and then spun away to see something else! Don’t you just love it. A couple of years ago we had a similar steady heavy rain and the river really came up ! See photos below. Fingers crossed! 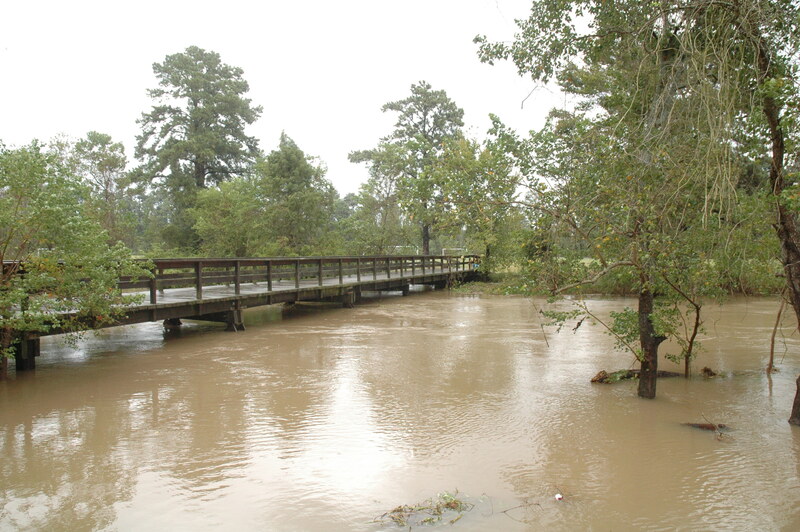 The creek by the soccer field during a flood event a couple of years ago. Normally you stand by tree in the foreground on the bank. 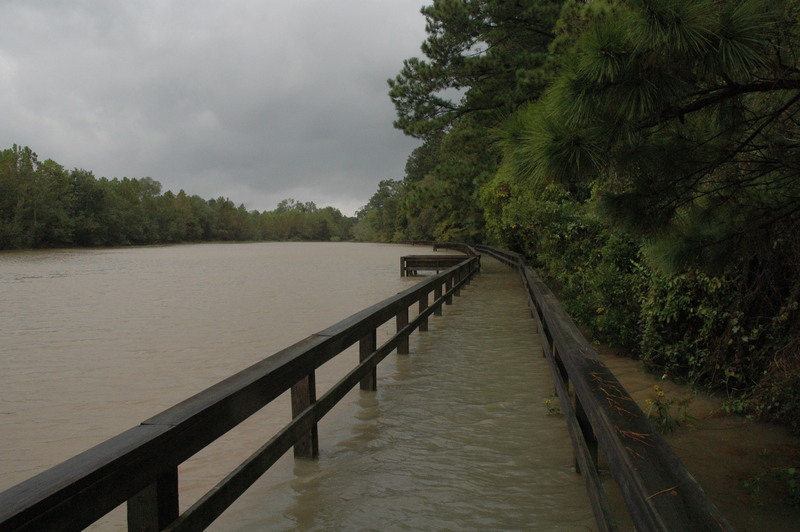 The walkway along the river where the kids can fish. Usually 3 feet above the water. Hopefully the creek don’t rise much higher than that! Yes, slow down and see the little things! Don’t ya just love how curious Caleb is!!? It was a day that definitely brought a smile to my face….my wife also gave me a very similar comment…Thanks again. Rain yehhhhh! Hope to see pictures of the rain’s outcome, super- sized vegetables perhaps? My carrots are splitting while in the ground….a sign of way too much water.I may need to raise my raised beds another foot or so! I love the wonder seen through the eyes of young children. I know Texas needs the rain but certainly not so much all at once.